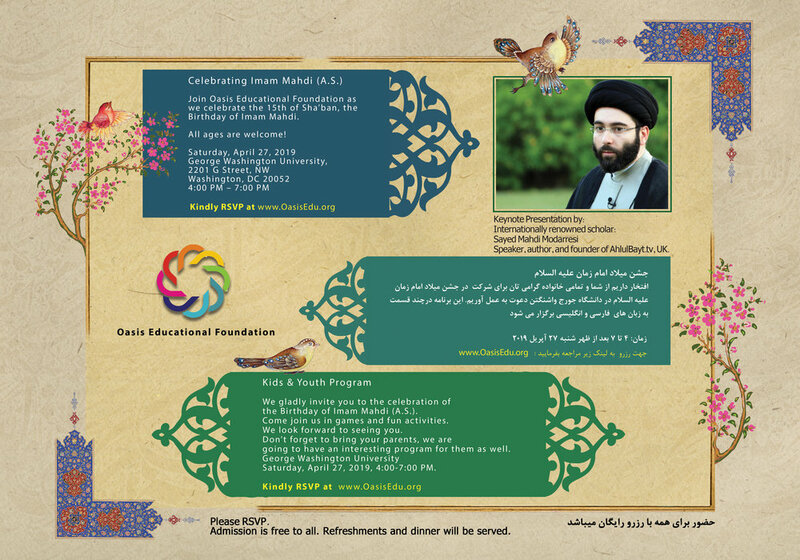 Invitation for the Celebration of Imam Mahdi's birthday in Washington D.C, USA. We cordially invite you and your loved ones to join us at this year's celebration of Imam Mahdi's birthday. There will be concurrent English and Farsi programs for adults, as well as simultaneous programs for children. Your attendance is cherished, and your timeliness, appreciated. We hope to see you there, inshaAllah. دعوتنامه جشن نیمه شعبان عزیزان ساکن منطقه واشنگتن دی سی, آمریکا. Oasis is offering a new class, beginning in Ramadan. The first class will be held on June 7th, at 8pm. © Oasis Educational Foundation. All rights reserved.